In the world of Deus Ex, everyone's hiding secrets, usually behind a passcode-protected computer screen. Here's some tips for hacking these terminals and revealing the secrets within in Deus Ex Mankind Divided Follow our Deus Ex Mankind Divided Hacking guide to become a hacking pro. When you hack something, note the Security Rating. 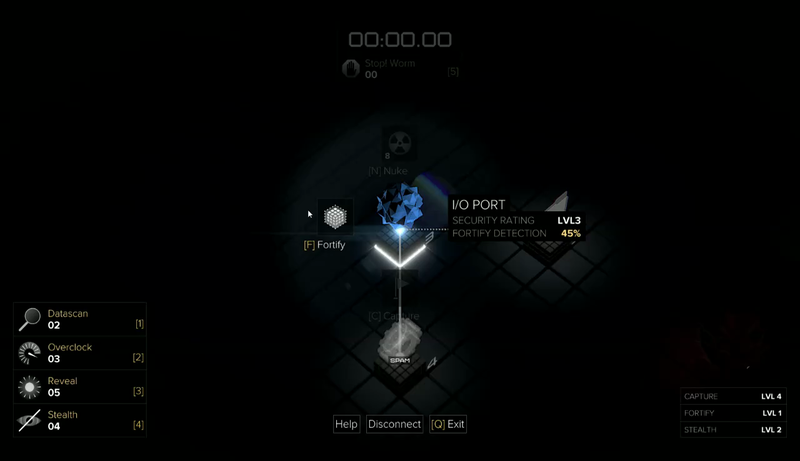 Not only does it indicate the difficulty of the hack, but it tell you the minimum Hacking Capture level it requires to even attempt it in the first place. A hack is successful when you traverse from the starting blue I/O port to capture all the green Registries, so creating a path to them should be your first priority. You make your path by capturing Directories, unlocking new routes. Each directory has its own Security Rating, which is a general indicator of difficulty to capture. The higher the Security Rating, the longer it takes to capture a node. Higher Security Ratings also stand a higher chance of capture attempts being detected. If they are, a timer will start. If you don't finish the hack by the end, the terminal will lock you out for a set amount of time. 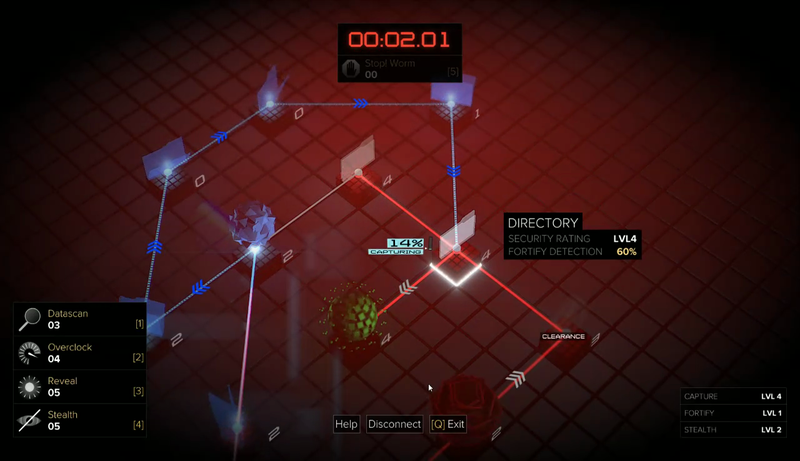 Increasing your Hacking Stealth levels will lower the chances of a trace occurring, so concentrate on leveling your Hacking Capture and Hacking Stealth in equal measure. Try to lower the average detection percentage well under 50%. You can attempt to capture multiple nodes at once, and if you're on the clock, it's something you definitely should do if you need to get multiple objectives. But if you're not, then you don't really need to rush, as capturing multiple nodes only increases the chances of a trace. Fortifying can slow down a trace should you be detected, but it also carries with it the same chance that a trace will start. Don't waste your time on fortifying and instead find the quickest, safest path to the Registries. Capturing a Spam node can slow down a trace a little bit, but don't necessarily go out of your way to capture one should a trace occur. When you're not being traced, capturing a Spam node with guarantee a trace happens, so avoid them at all costs unless a trace already started. Transfer and Clearance nodes will reduce the Security Rating of different nodes, so capture them whenever you can. Datastores are never necessary to complete a hack, but they can give you bonus Credits and Experience. Grab them only if you have time. Stop! Software can be used to freeze a trace for a set amount of time. Use it as your panic button if you find yourself with not quite enough time. Nuke Software automatically captures a node instantly. Save these for high Security Ratings and when traces increase the Ratings of nodes you haven't captured yet. Datascan Software reveals the layout of the entire network and all its nodes. It also reveals hidden Firewalls, which delay your capture and instantly start a trace. Firewalls can mostly be found along single direction connections, so use your Datascans there before you start capturing. Overclock Software will speed up your capture speed for a few seconds. Use this on a difficult string of nodes and in concert with Stop! Software if you're running out of time. Hacking attracts suspicion in all but the most trusting environments, so try to stay out of sight whenever you attempt a hack. People in places like Task Force 29's headquarters, however, won't bat an eye at your hack attempts, so break in all you want. Whenever possible, look around a terminal for Pocket Secretaries that have codes on them. Knowing the code to a terminal means you don't have to take the time to hack it. This is essential for getting through higher Security Rating terminals early on. Bear in mind that a Multitool can break into any system without any work on your part. All you have to do is point it at the terminal for a few seconds. They can be crafted with 120 Parts. Tagged with Action Adventure,	Eidos Montreal,	Guides,	Role Playing Games,	Single Player,	Square Enix.